I’ve put up several pieces about workers’ control and industrial democracy, the system in which the workers in a particular firm or industry have their representatives elected on to the board of management. It was particularly highly developed in Communist Yugoslavia, following the ideas of Milovan Djilas and Edvard Kardelj, and formed an integral part of that country’s independent Communist system following the break with Stalin and the Soviet-dominated Comintern in 1948. In 1963 the Fabian Society published the above pamphlet by Frederick Singleton, a lecturer on Geography and International Affairs in the Department of Industrial Administration at the Bradford Institute of Technology, and Anthony Topham, a staff tutor in Social Studies in the Adult Education department of Hull University. The pamphlet had the following contents. Chapter 1 was on Political Structure, and contained sections on the Communist Assumption of Power, the 1946 Constitution, the 1953 Constitution, and the Policy of the League of Communists. Chapter 2: Economic Planning, had sections on the Legacy of the Past, From Administration to Fiscal Planning, Autonomy for the Enterprise, the Investment System, and Recent Developments. Chapter: The Working Collective, has sections on the Workers’ Council, the Managing Board, the Director, Departmental Councils, Economic Units, the Disposal of Funds by Economic Units, Allocation of Personal Income, Structure and Role of the Trade Unions, the Right to Strike, Education for Workers’ Self-Management, Workers’ Universities, Worker’s Management in Action: Decision Making, Structure of a Multi-Plant Enterprise, and Incentives or Democracy: the Problem of Motive. In considering the lessons which British socialists may draw from the Yugoslav experience, we must not lose sight of the different nature of our two societies and the disparity in levels of industrial development. 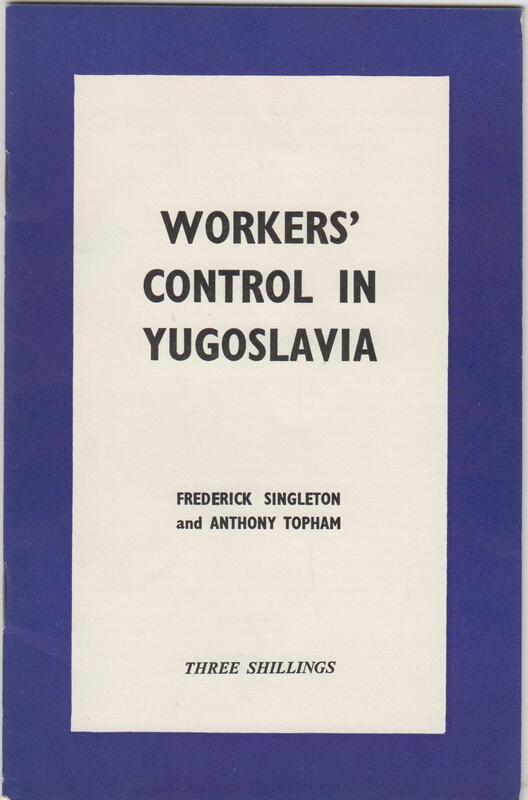 But it is also relevant to ask how far the ideas of workers’ control could, with the stimulus of the Yugoslav experience, become a truly popular element of British Labour policy. It is true that, with the Yugoslav exception, past experience of this form of Socialism has been inconclusive and fragmentary. Usually, it has been associated with periods of revolutionary fervour such as the Paris Commune of 1871, the Catalan movement during the Spanish Civil War, and the factory Soviets of Russia in 1917-18. The experience of Owenite Utopian communities in this and other countries is misleading, in that they existed as small and vulnerable enclaves in a basically hostile society. On the other hand, there is an authentic tradition within the British Labour movement, represented by the early shop stewards’ movement, the Guild Socialists and Industrial Unionists, upon which we can draw. The Fabian tradition too, is not exclusively centralist or bureaucratic. In the 1888 volume of Fabian essays, Annie Besant raised the question of decentralisation. She did not believe that ‘the direct election of the manager and foreman by the employees would be found to work well’, but she advocated control of industry ‘through communal councils, which will appoint committees to superintend the various branches of industry. These committees will engage the necessary managers and foremen for each shop and factory.’ The importance attached to municipal ownership and control in early Fabian writings is related to the idea of the Commune, in the government of which the workers have a dual representation as consumer-citizens and as producers. This affinity to Yugoslav Commune government is even more marked in the constitutions evolved in Guild Socialist writings. The history of the progressive abandonment of these aims, and the adoption of the non-representative Public Corporation as the standard form for British Socialised undertakings, is well known. Joint consultation, which was made compulsory in all nationalised industries, became the only instrument of workers’ participation. Yet the problem of democracy in industry is one which should be of great concern to the British socialist. It must surely be apparent that the nationalised industries have failed to create amongst the mass of their workers a feeling of personal and group responsibility. Even in the most ‘trouble-free’ gas and electricity industries, there is little real enthusiasm for the present system of worker-management relations. Nationalisation may have appeared to the Labour government to have solved the problems of the industries concerned. But the experience of the workers in these industries has not confirmed this. They found that joint consultation between managers and unions leaders plus vaguely defined parliamentary control did not create anything resembling industrial democracy. Had it done so, there would have been much stronger popular resistance to the anti-nationalisation propaganda which was so successful in the years preceding the 1959 election. We therefore feel that the basic aim of the Yugoslavs is one which has validity for our own situation, and we conclude with some observations on the British situation suggested by an acquaintance with the Yugoslav system. The forms of economic organisation and management which have been evolved by the Yugoslavs are unique, and a study of them provides a valuable stimulus to those who seek ‘a real understanding of a scheme of workers’ control that is sufficiently comprehensive to operate over an entire industry, from top to bottom, and through the whole range of activities’. However, as the scale of production grows, the problem of ensuring that democratic control extends beyond primary groups such as Economic Units through the intermediate levels to the central management of the firm and the industry, becomes more and more difficult. There is a strong body of opinion which believes that schemes of workers’ control must ultimately founder in the context of modern large-scale production. The small, multi-firm industries of the Yugoslav economy make democratic control less difficult than in a highly developed industrial society such as our own. But questions, which should be asked in relation to our own economy are: how far could the nationalised industries be broken down into the smaller, competing units, without serious loss of efficiency? How far is the growth in the average size of firm (as opposed to scale of production units) the outcome of purely commercial and power considerations, rather than concern for increased efficiency through economies of scale? How far have we been misled by the mystique of managerial skill into accepting the necessity of autocratic control by the managers in both private and public industries? After all, the principle of lay control over salaried experts is the normal and accepted principle in national and local government, and within the Co-operative movement. The decisions in these fields are no less complex and ‘technical’ than in industry. Where lay control in local Councils and Co-operative Management Boards is more apparent than real, how far is this due to the prevailing faith in technology, which makes us reluctant to transform the contribution of the elected representatives by a thorough and enthusiastic education programme of the kind found in the Yugoslav Workers’ Universities? In the conditions of modern industry, decisions taken by line managers and directors are frequently a matter of choosing between alternative course the consequences of which have been calculated by technical staffs. Such decisions are of a social and political, rather than a technical nature, i.e. they are precisely the sort of decisions which should be undertaken by democratic bodies. These factors should be borne in mind when examining the conclusions of some writers that, whilst the Yugoslav experience is interesting, and may have relevance for countries at a similar stage of industrialisation, it has little bearing on the problems of advanced industries societies. It’s even more relevant today as when the Manics first wrote it, with the rise of the Alt Right and Libertarian Fascism under Trump, the victories of the Fascist parties in eastern Europe and the rise of the AfD in Germany. And experience has repeatedly shown that what the extreme right and racists do to minorities, like Blacks, Jews, Muslims or whoever, they then feel confident enough to do it to the rest of mainstream society. A few weeks ago The Young Turks reported how the cops arrested an American nurse, because she rightly refused to hand over medical information on suspect the hospital was treating. The cop’s request was actually illegal under American law. Even so, they arrested her for refusing their command. The Turks made the point that such Fascist policing has previously been confined to Blacks, but now it was being used against the White middle class. Just as the Libertarians and Republicans have used images of Black poverty, crime and ‘welfare dependency’ to get White Americans to support them and their campaign to cut the same welfare services that poor Whites depend on. Just like the Tories, Lib Dems and Blairites have been doing over here.